You’ll be able to clearly see my portfolio of work which ranges from children’s narrative to editorial to promotional, adapting my style to both watercolour and digital methods. You can view a choice selection of my sketchbook imagery that supports my way of working and hones my skills. Not only do you get to see my work but you get to play with robins too! I like how the nature of the robin images changing reflect bird like movements. It seemed to come together well. My blog will continue to be updated with news, new work and my various creative thoughts and my website will be a platform for viewing my best work. I hope you enjoy them both! 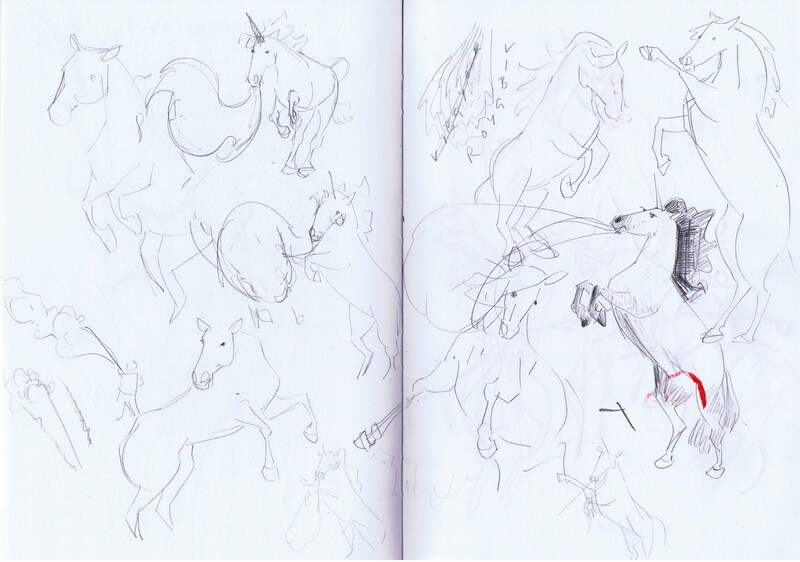 Wow, I signed up to The Sketchbook Project run by Brooklyn Arts Library last summer; 80 pages and 5 months later my sketchbook was a completed piece! 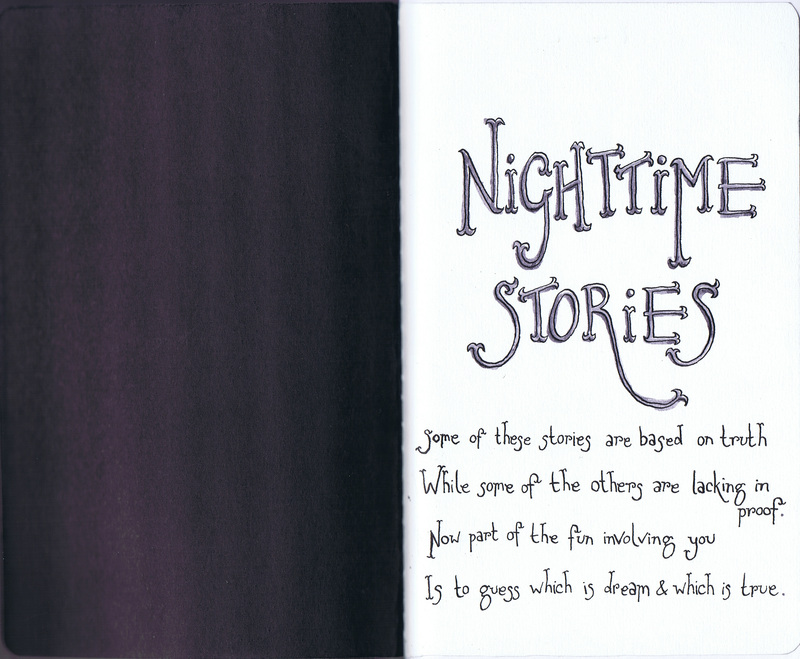 The idea was to pick a theme from a list – I chose ‘Nighttime Stories’ – and they supplied you with a sketchbook. The theme was just a starting place, and the book was mostly a suggestion of the dimensions you needed to keep to. To begin, I rebound The Sketchbook with paper I like to work with and got stuck in. 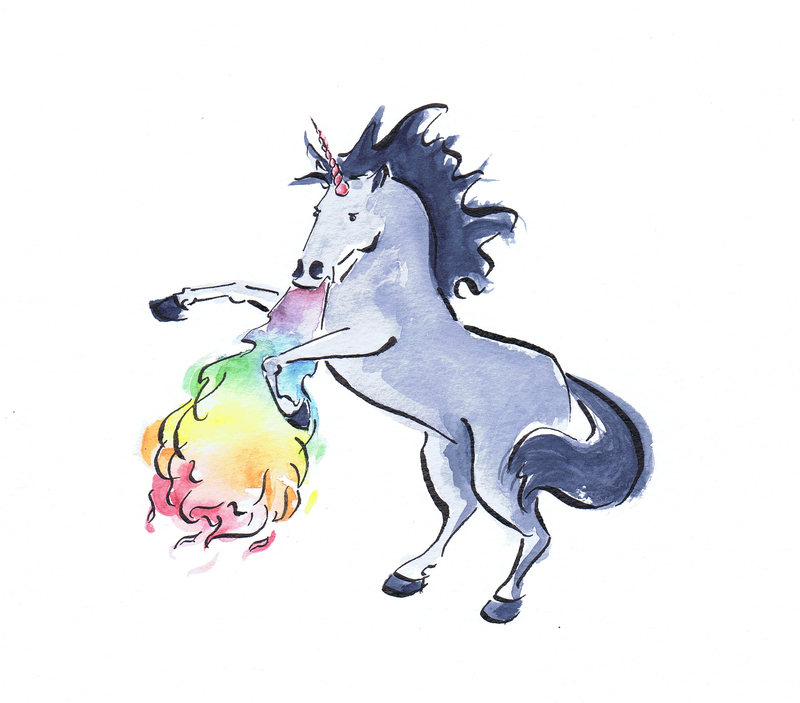 As you will see, inspiration came from many different realms, some pages include zombies, others evil clowns, whilst for light relief you can play with the Random Dream Generator or enjoy The Sheep of Sleep. To aid the creative process, I took advantage of the many goings on offered by the city I live in to foster inspiration. 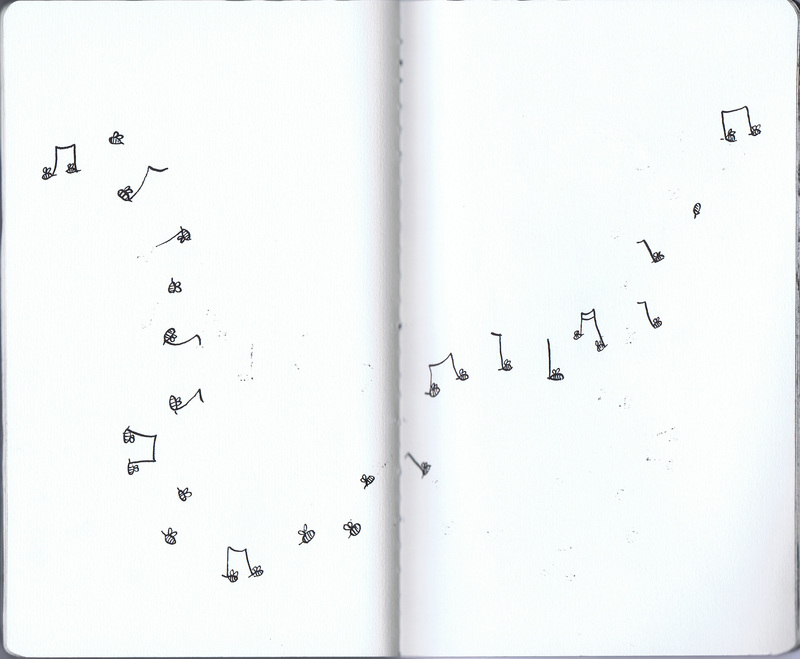 Thus, as page 1 of the sketchbook asks you; which pages are based in reality and which are dream? 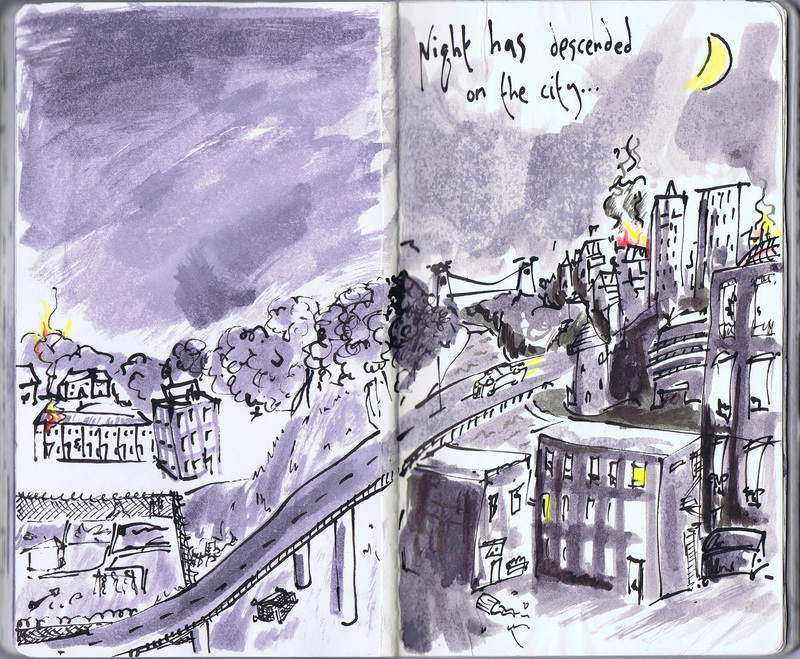 Now finished, The Sketchbook needs to return from whence it came so that it may go on a tour of the USA. Once the tour is finished, my sketchbook will reside in Brooklyn Arts Library with all the other entries for this project. 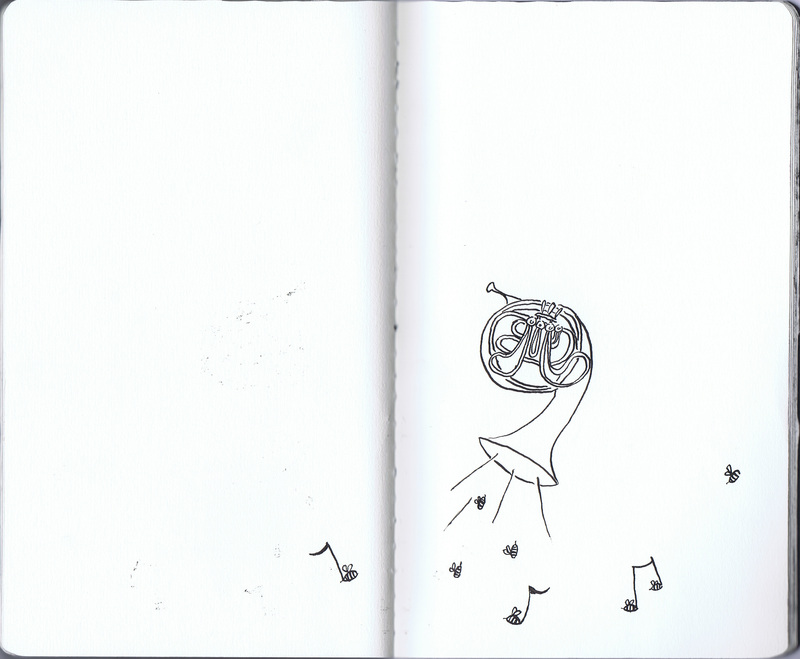 After spending so much time forging a close relationship with my sketchbook, I’ll admit I’m a little sad to see it go. Like a parent watching a child leave home, I know not only that it’s time, but that it’s going to a good home too. 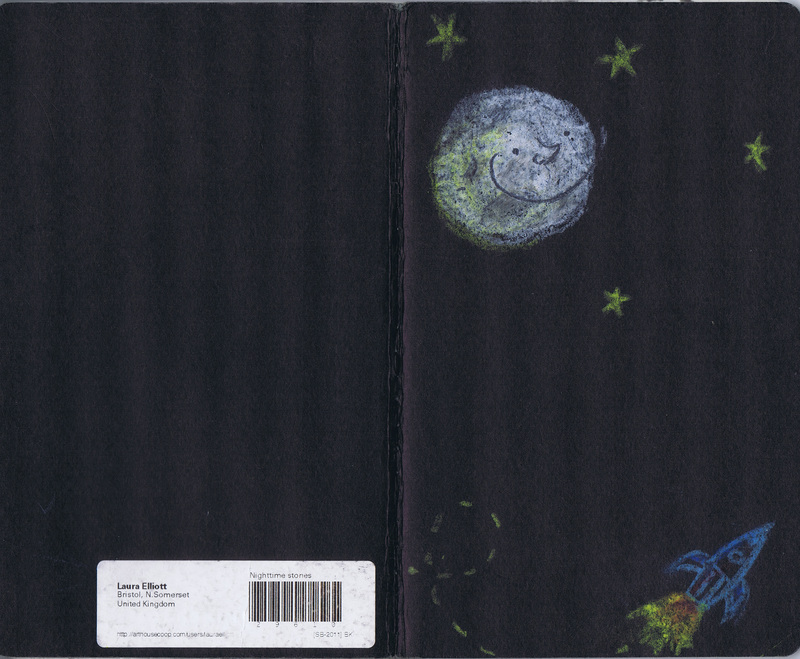 The cover – This is where it all began, my first inspiration being the night sky. Here you are first introduced to the moon, who turns up later in the book. To show up against the black cover, I used oil pastels, not something I usually use but I felt this book was a good chance to experiment with technique and materials. Title Page – I felt as I didn’t put the title on the cover, it should at least live here. A short poem gives you an idea of the general thrust of the book as, explained earlier, inspiration came from many different areas. 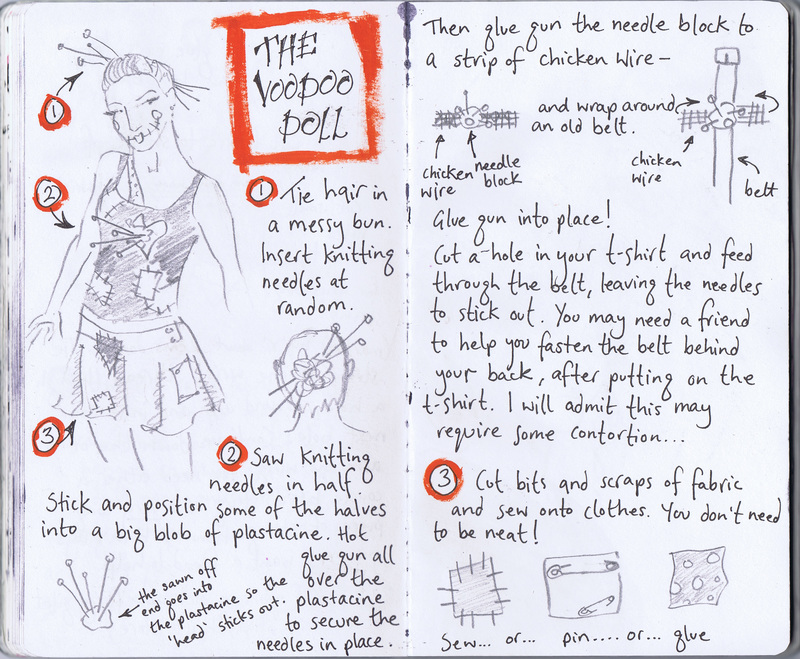 As well as using the sketchbook to play with visual imagery, I enjoyed using it to work with creative writing too. 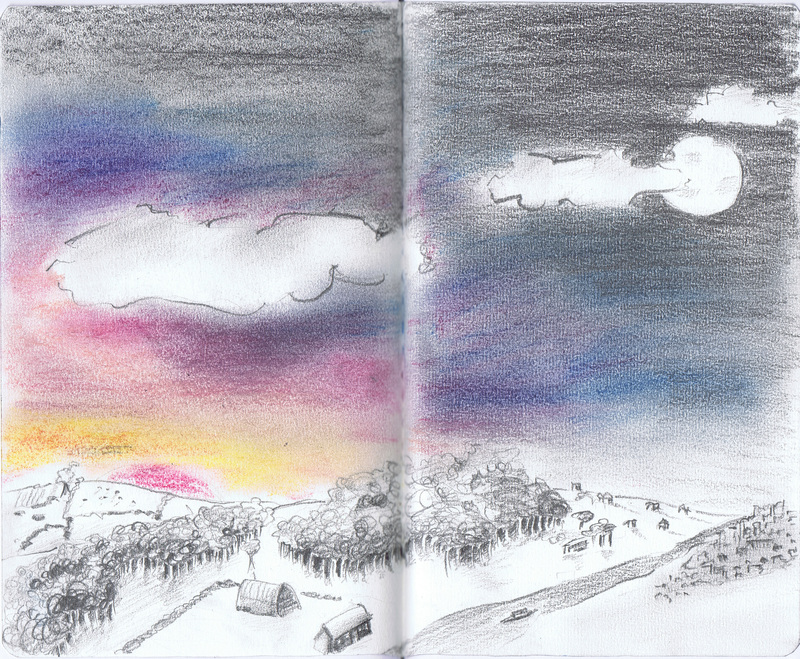 Page 2 and 3 – sunset over a rolling landscape, where chalk pastels blend into pencil. 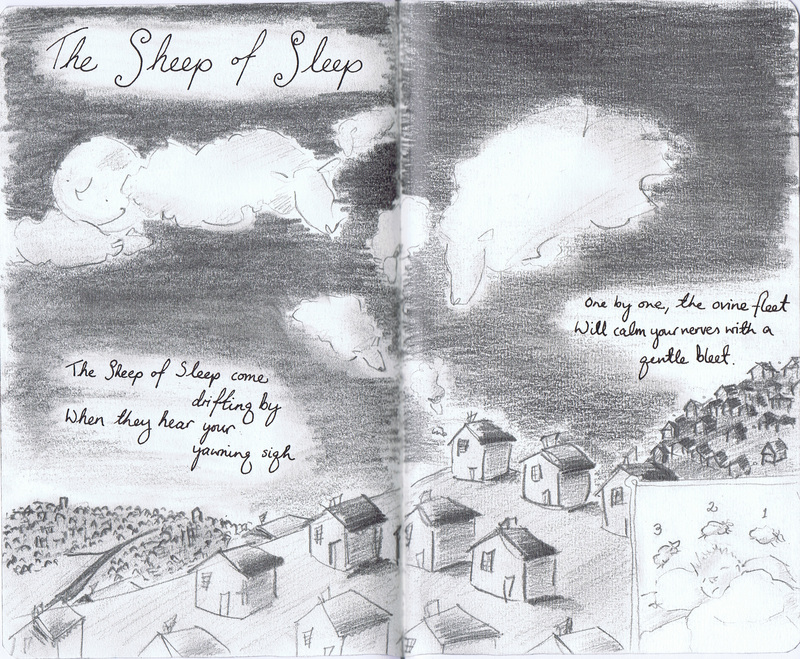 Page 4 and 5 – Pencil drawing of The Sheep of Sleep, who help a boy drift off. Page 6 and 7 – A few characters from Carneyville. The lady on the right was a ventriloquist called Eglantine, with her doll ‘Eglantiny’. Here I used crayons and pencils. 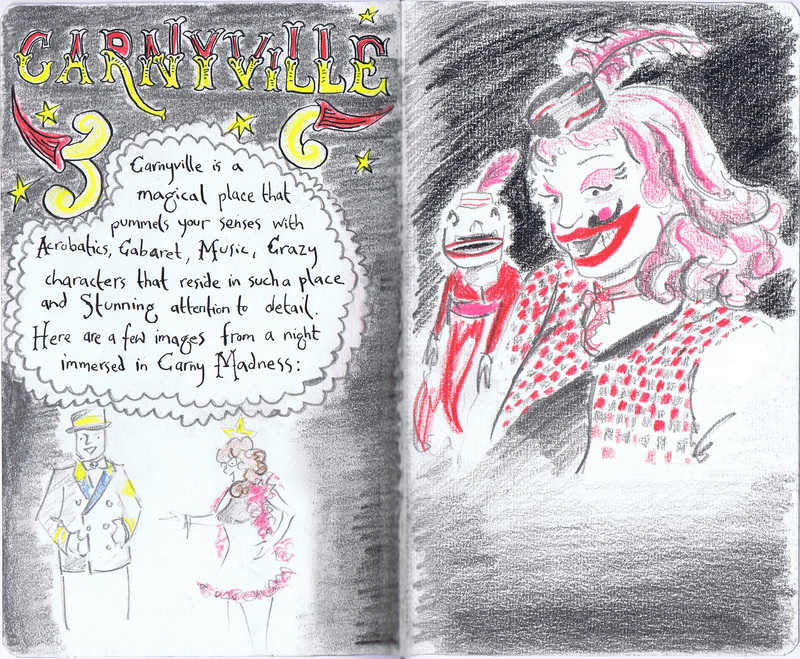 Page 8 and 9 – More characters from Carneyville. 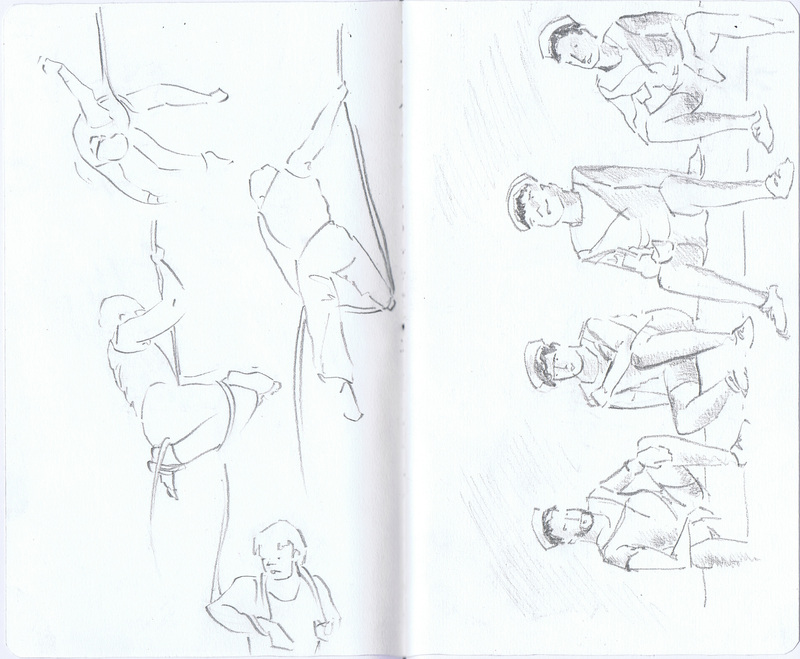 Quick pencil sketches of a man doing a performance with a suspended rope and a group of sailors watching another performance. 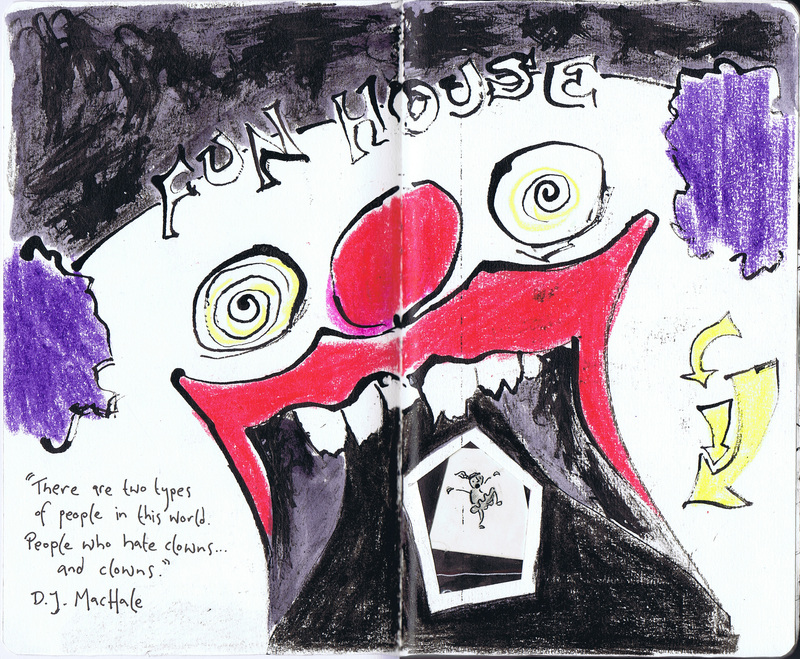 Page 10 and 11 – Ink and crayon image of a clown, die cut pages lead you through to another story in the book. 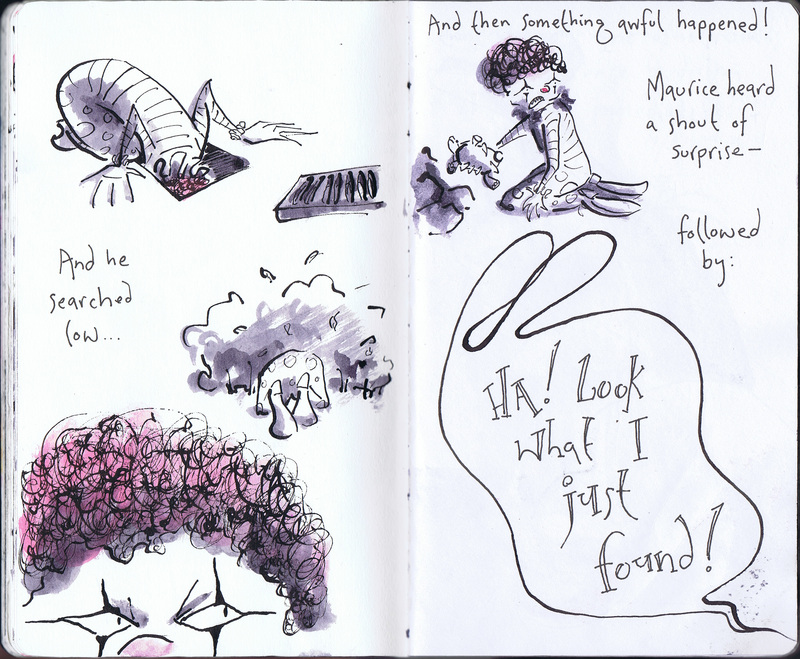 Page 12 and 13 – Maurice the Evil Clown. An older children’s book about an evil clown who has a secret that may ruin his career as an evil clown if he were to be found out. 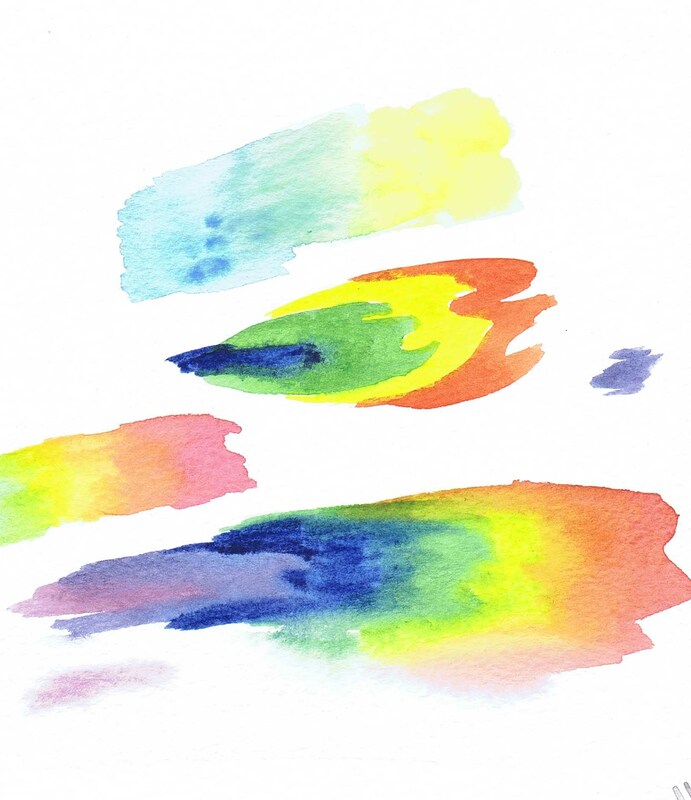 The whole narrative uses pen and ink and watercolour. 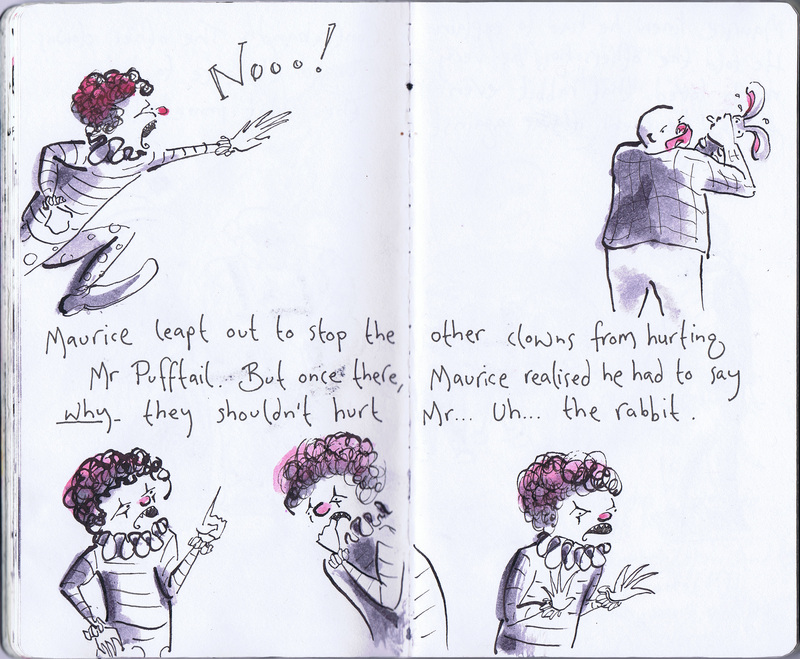 Page 14 and 15 – Maurice the Evil Clown. 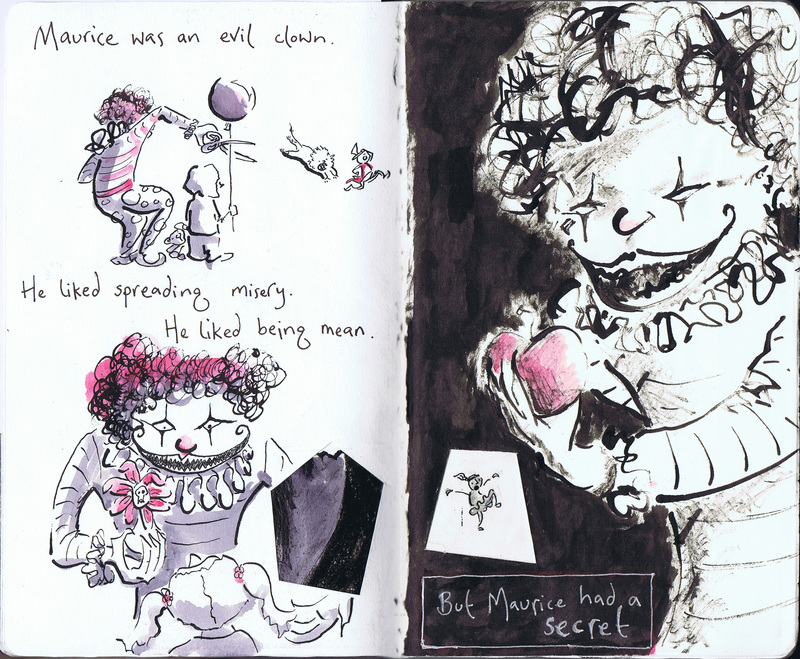 Page 16 and 17 – Maurice the Evil Clown. 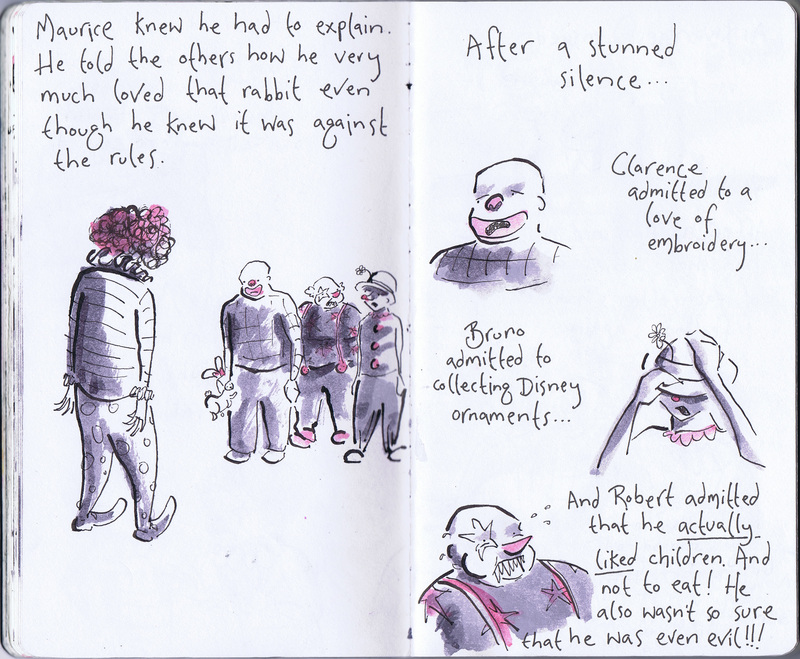 Page 18 and 19 – Maurice the Evil Clown. 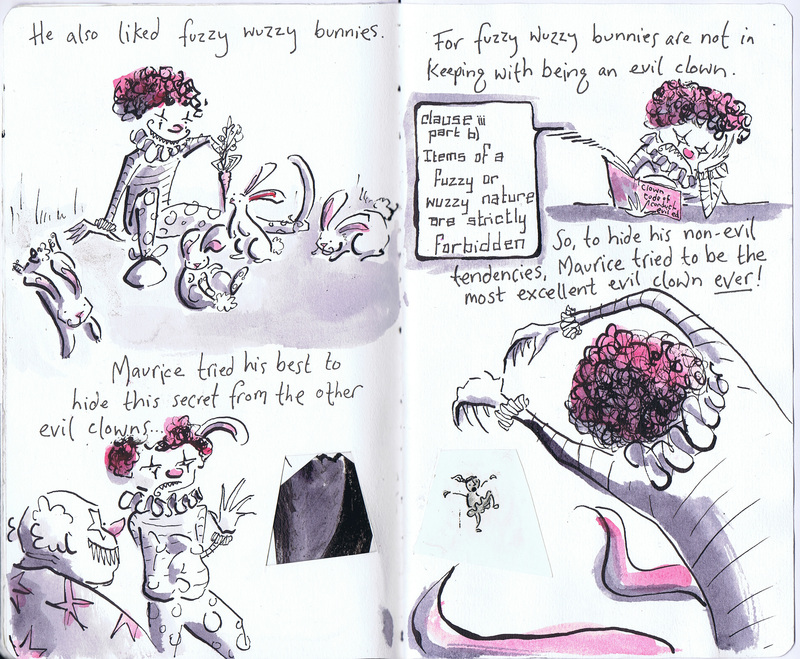 Page 20 and 21 – Maurice the Evil Clown. 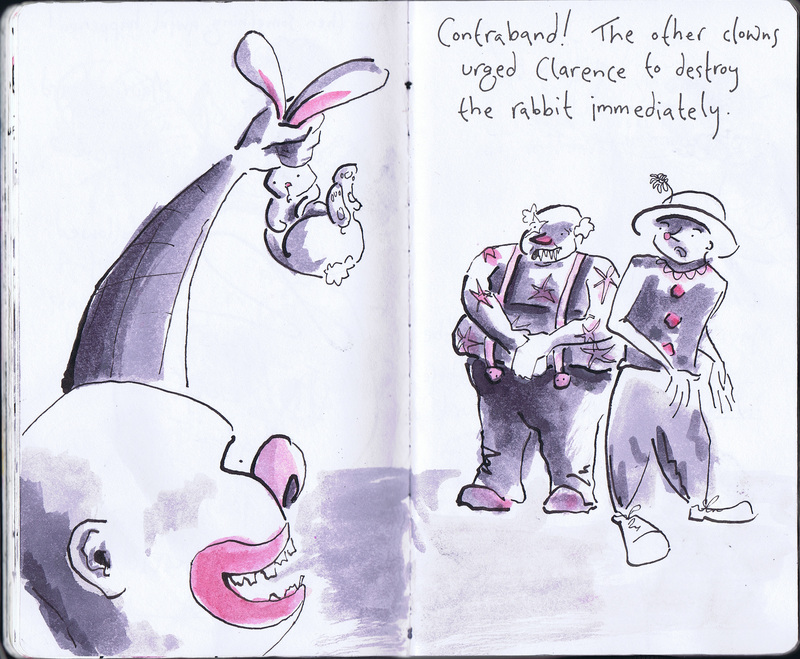 Page 22 and 23 – Maurice the Evil Clown. 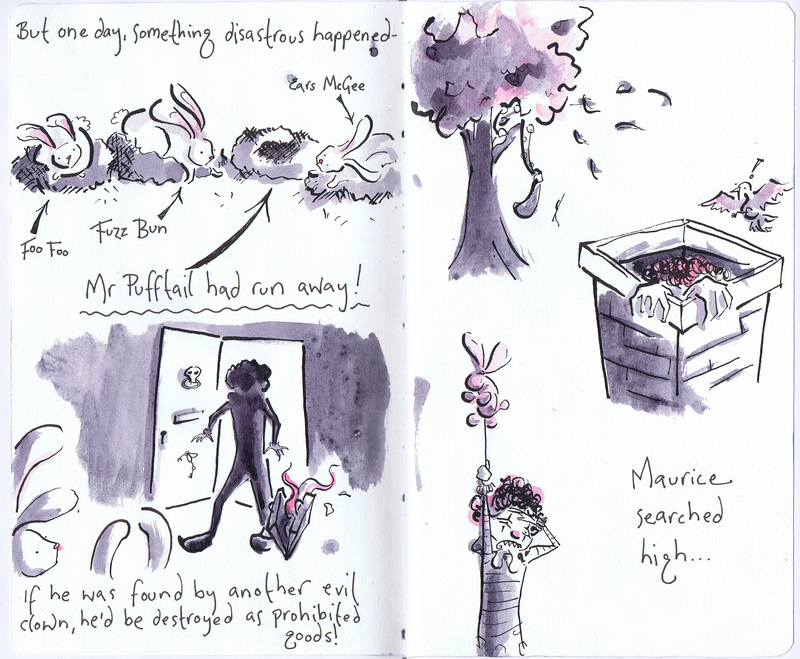 Page 24 and 25 – Maurice the Evil Clown. 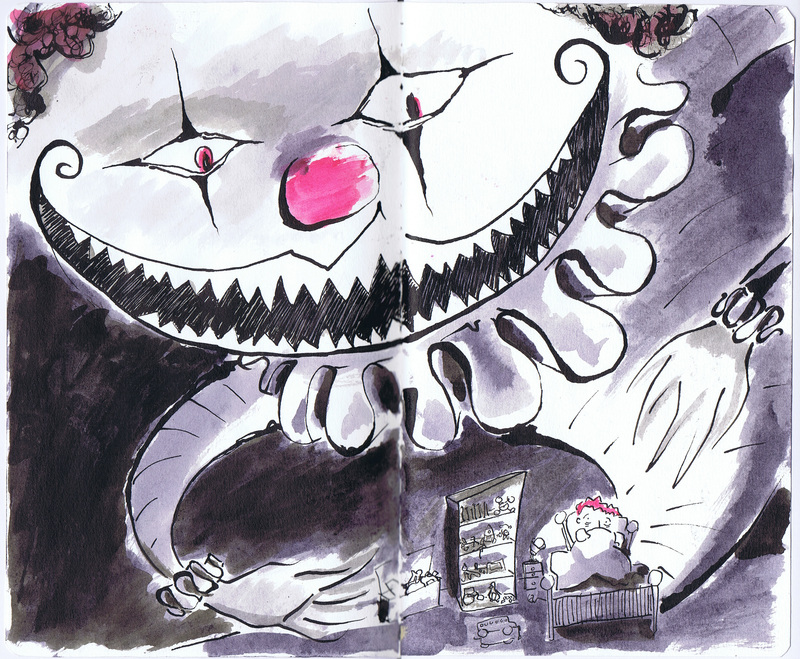 Page 26 and 27 – Maurice the Evil Clown. Page 28 and 29 – Maurice the Evil Clown. Conclusion. 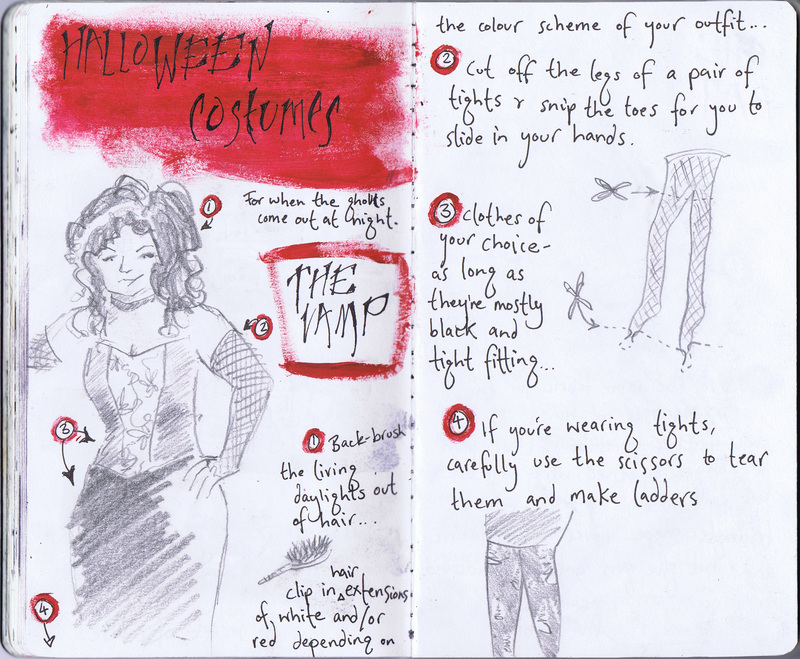 Page 30 and 31 – A ‘How To’ to make a Halloween costume for ‘The Vamp’. 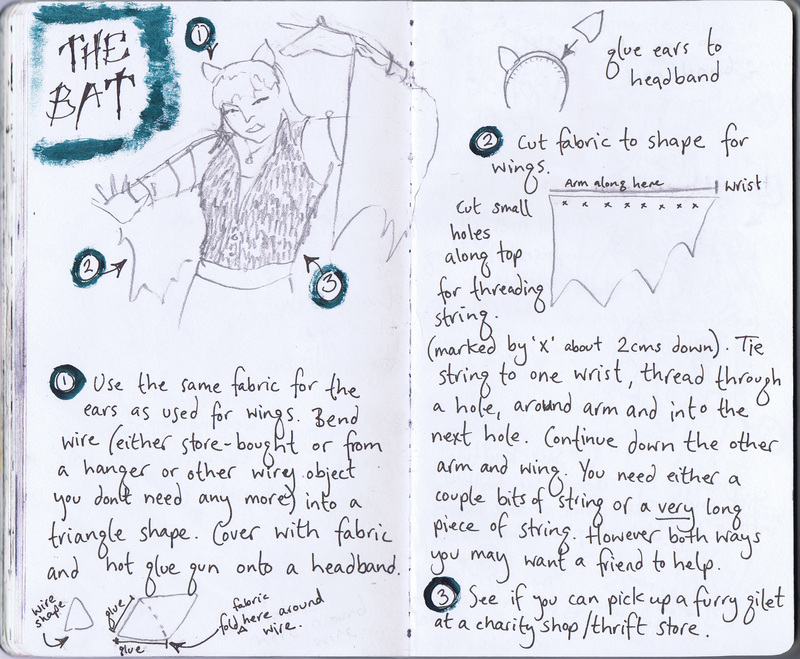 Page 32 and 33 – A ‘How To’ to make a Halloween costume for ‘The Bat’. 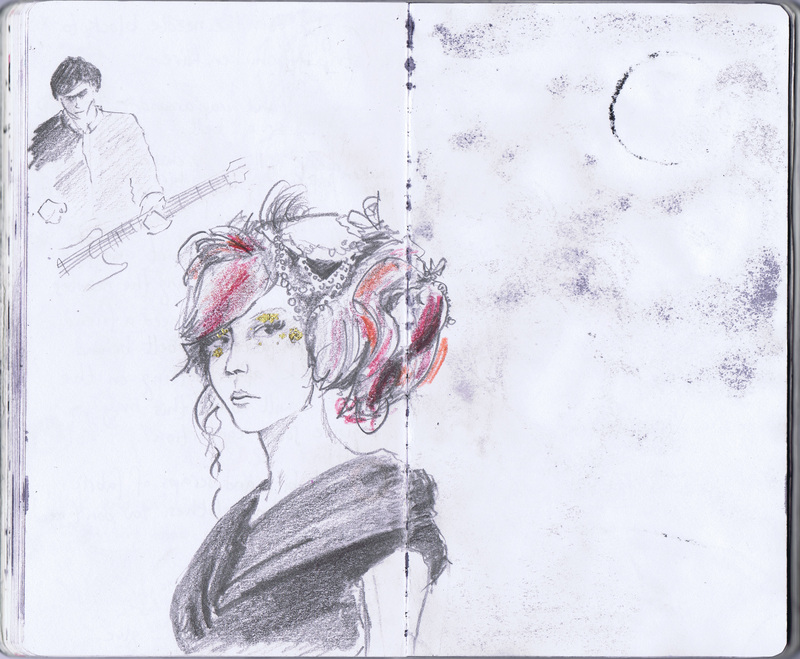 Page 36 and 37 – Pencil sketch using crayons and gold leaf for a portrait of the singer Gabby Young. 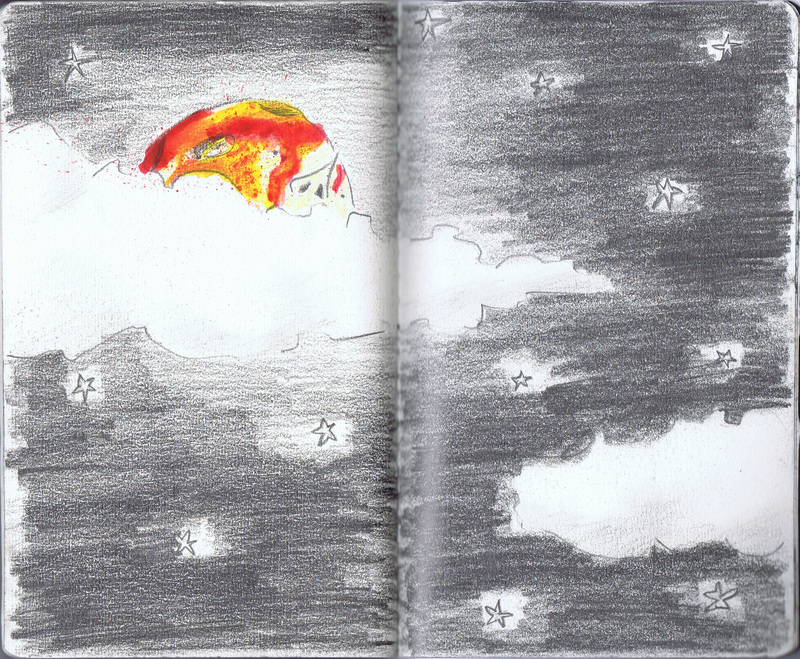 Page 38 and 39 – Moon and Rocket narrative. 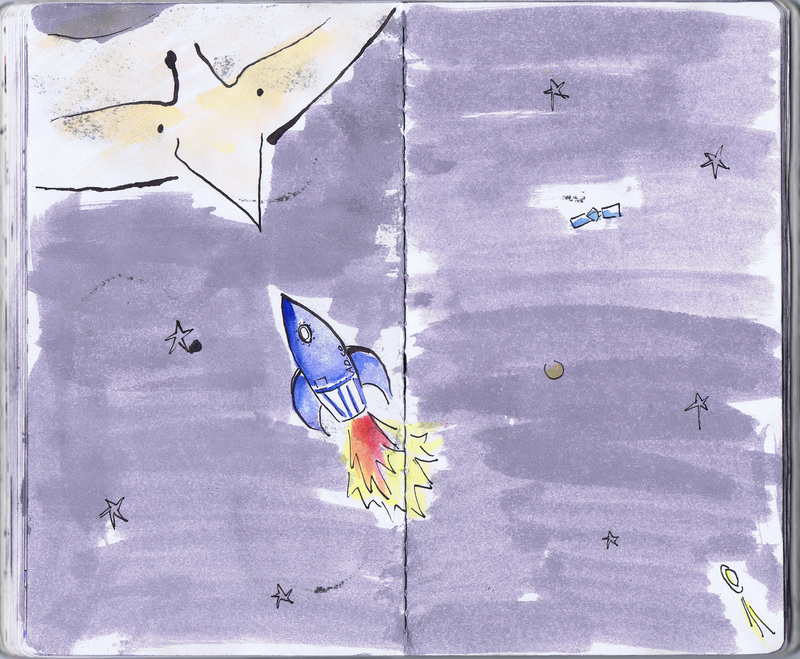 Using ink and watercolour, the moon and rocket from the front cover appear in their own story! 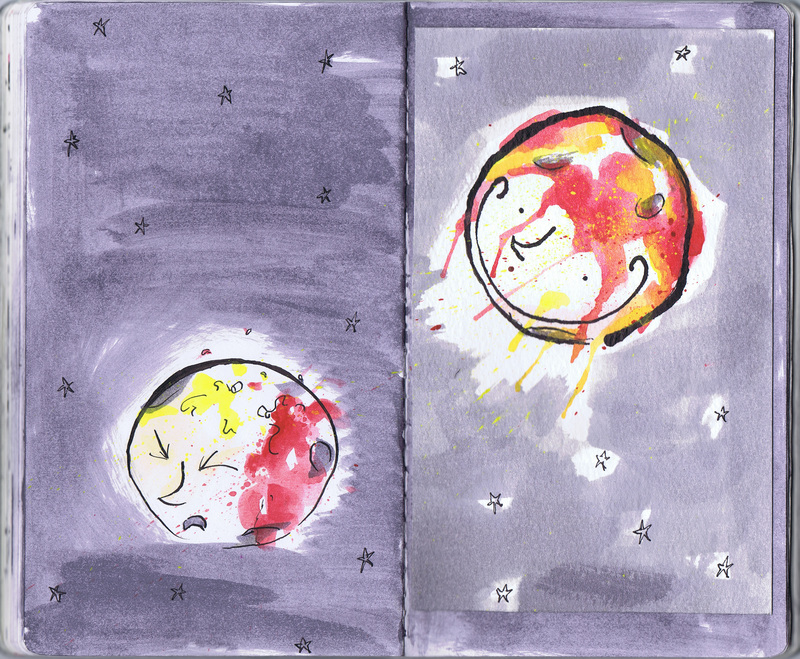 Page 40 and 41 – Moon and Rocket. 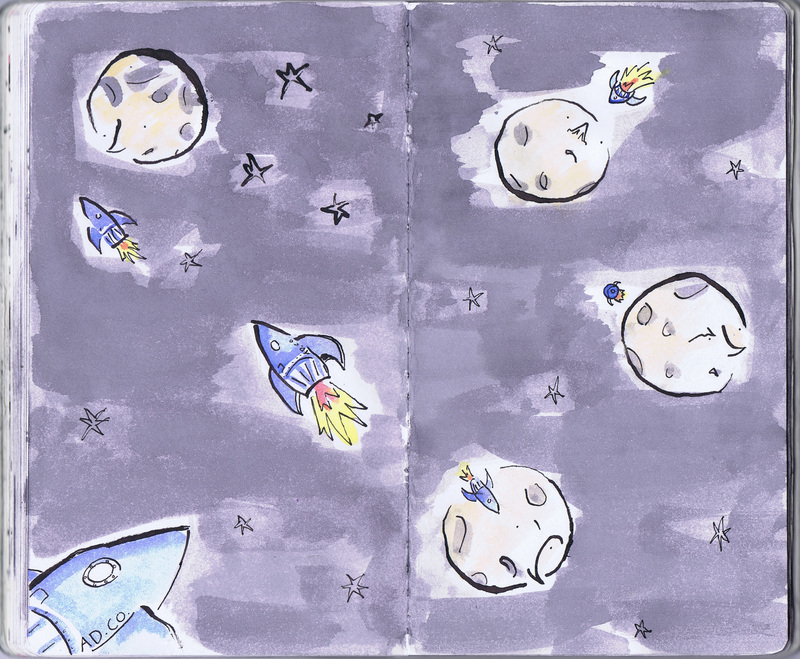 Page 42 and 43 – Moon and Rocket. 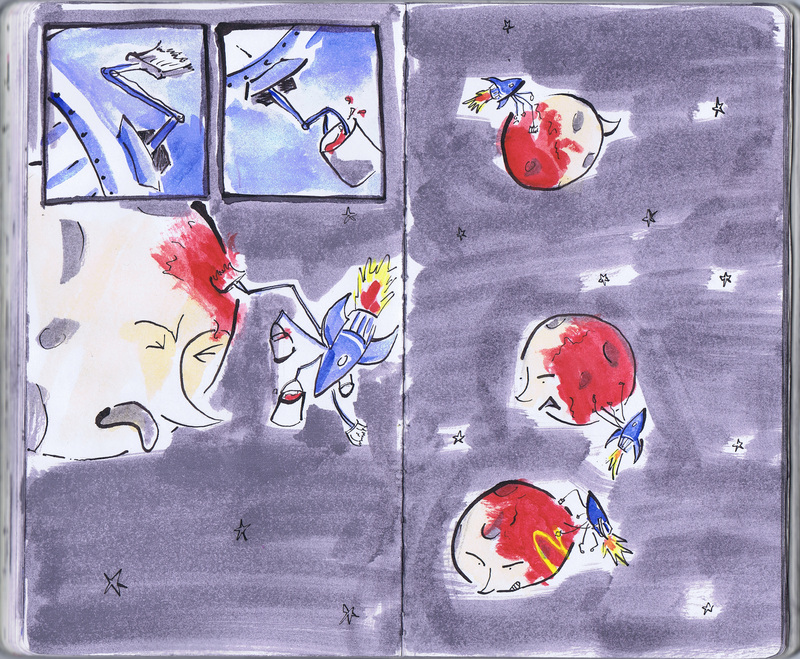 Page 46 and 47 – Moon and Rocket. 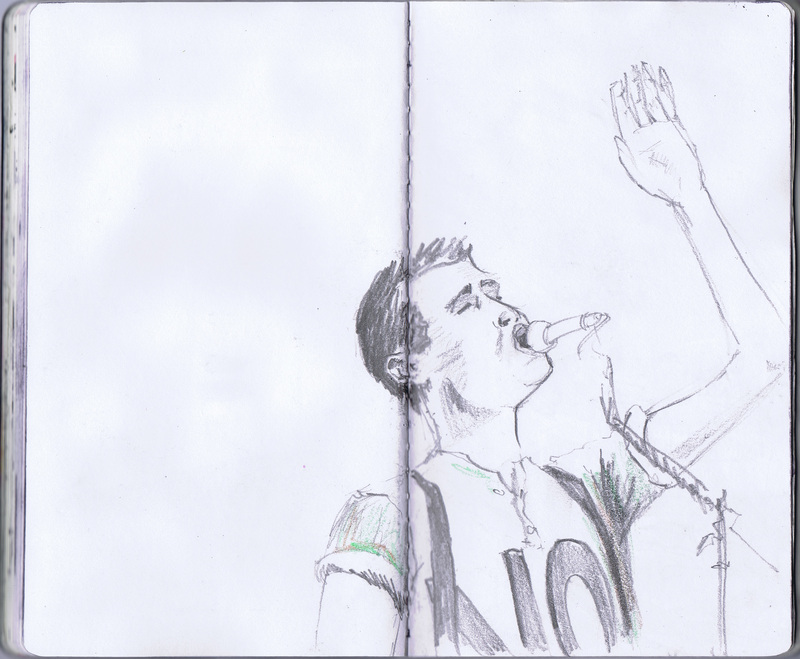 Page 48 and 49 – Pencil sketch portrait of The Agitator. Page 50 and 51 – I used pen and ink and pencil for a landscape setting the scene for a zombie narrative. 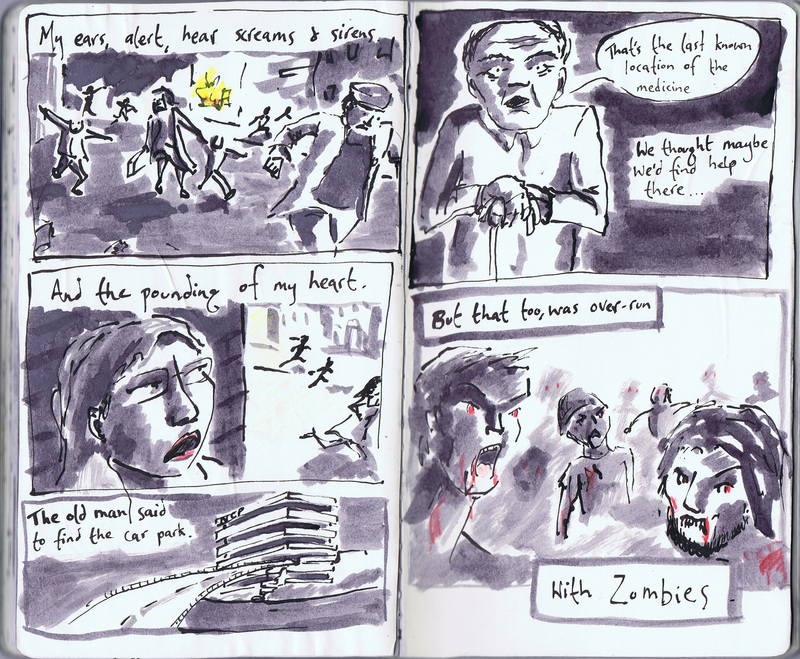 Page 52 and 53 – Zombie narrative told using a graphic novel style. 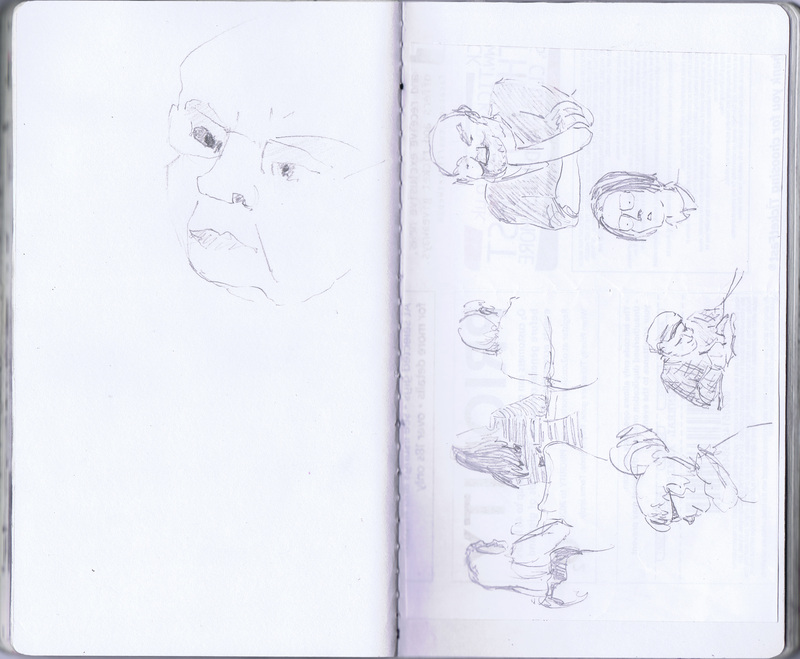 Page 54 and 55 – Pencil sketches of people drawn whilst waiting in a cafe bar. There is one guy I drew who looked like he was doing the same and when I left we gave each other a sort of knowing nod which was a lovely moment to share. 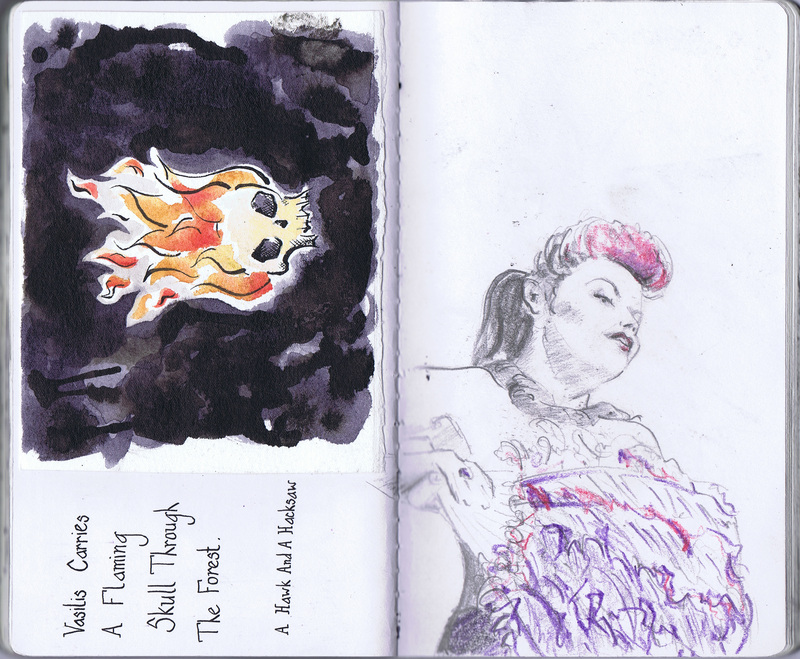 Page 56 and 57 – Left page: watercolour painting of a flaming skull inspired by the song ‘Vasilis Carries A Flaming Skull Through The Forest’ by A Hawk And A Hacksaw. Worked with hand rendered font here too. 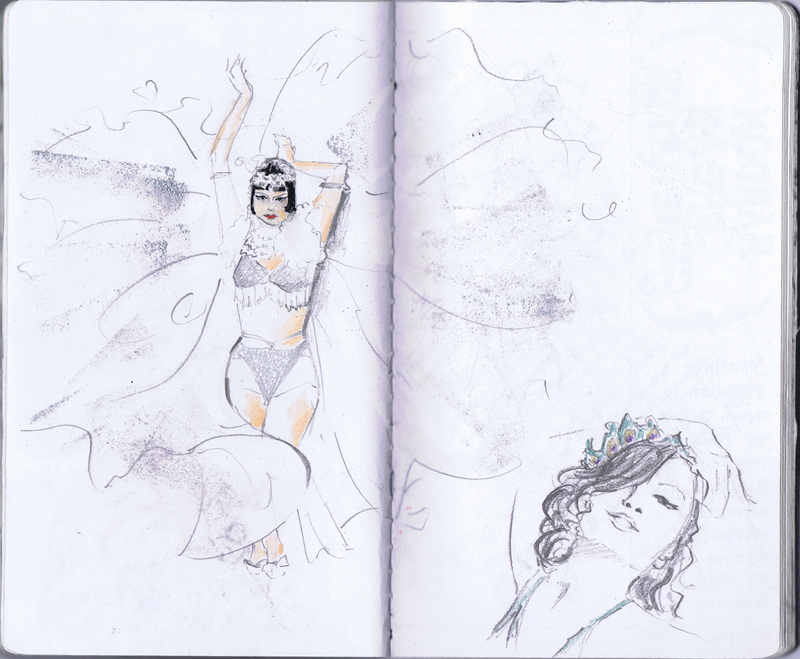 Right page: pencil and crayon portrait of the burlesque dancer Poppy von Tarte. 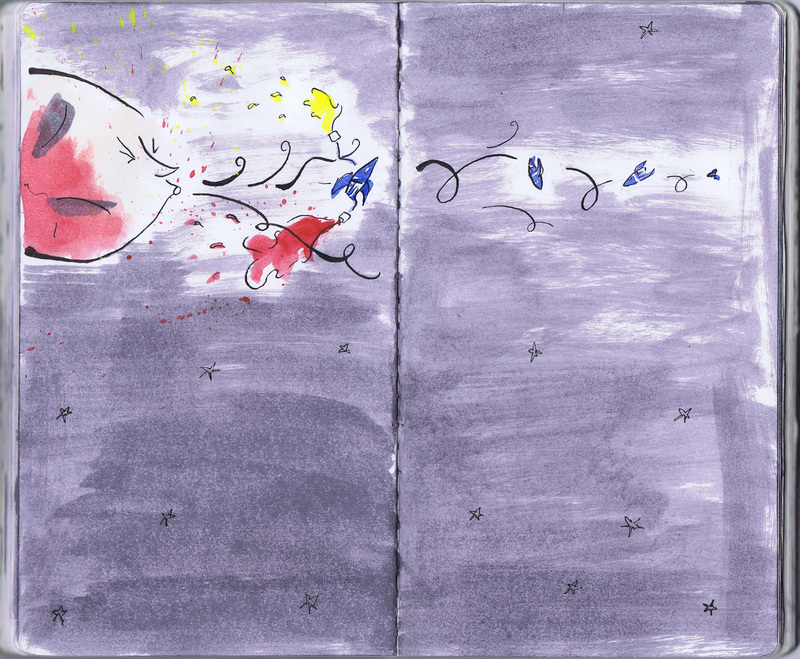 Page 58 and 59 – Pencil, watercolour and embossed powder. Portrait of the burlesque dancer Vicky Butterfly. Page 60 and 61 – The Random Dream Generator. 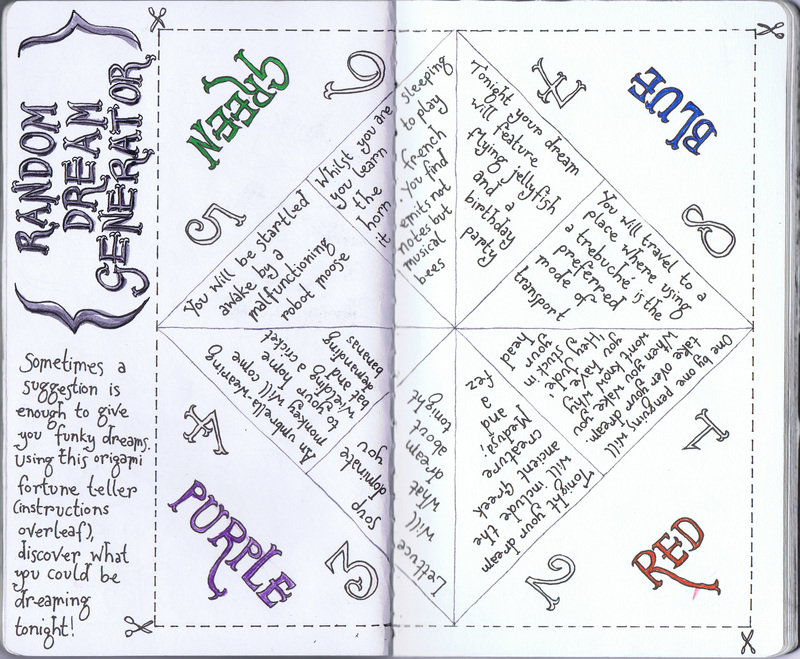 Origami fortune teller to suggest what you may dream about tonight. Print out and make one yourself! Hand rendered font. 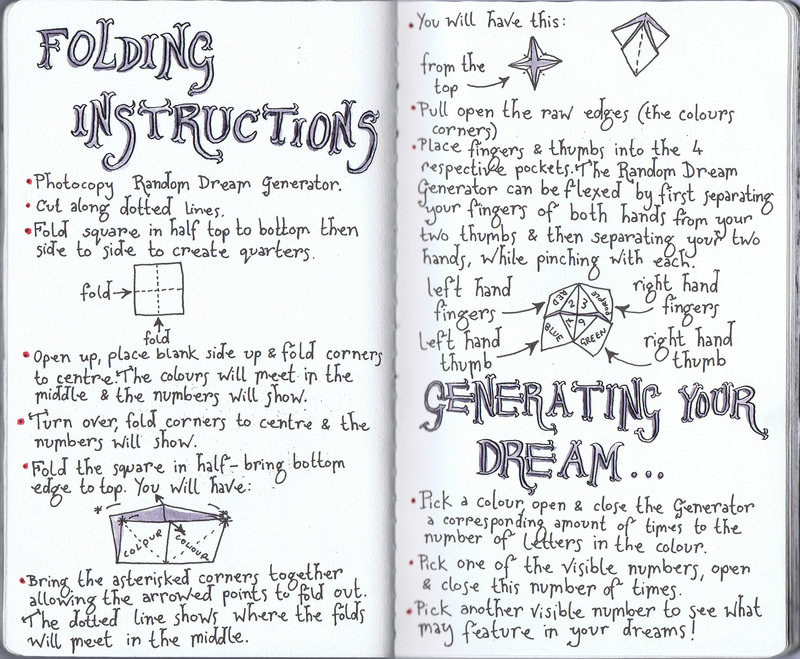 Page 62 and 63 – Instructions for the construction of your Random Dream Generator. Hand rendered font. 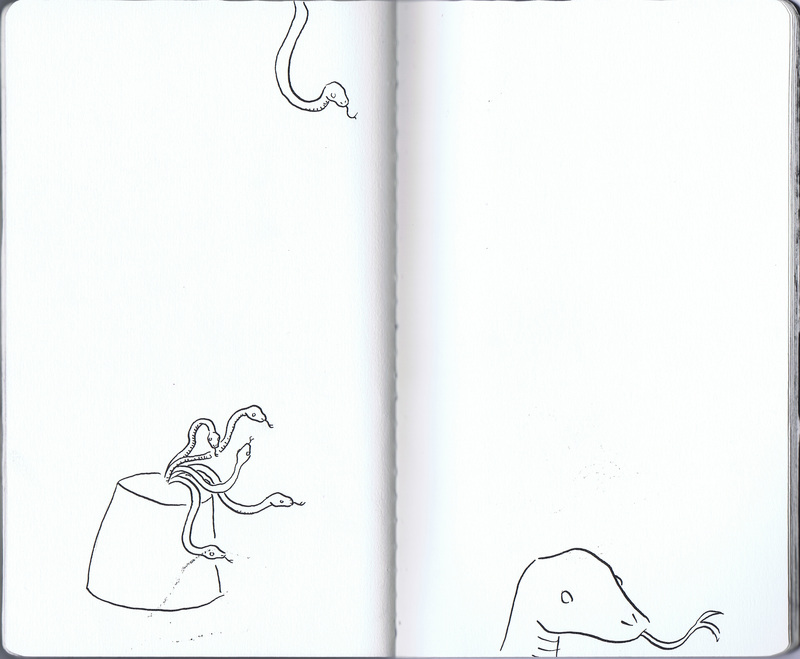 Page 64 and 65 – Pen and ink illustrations as suggested by the Random Dream Generator. 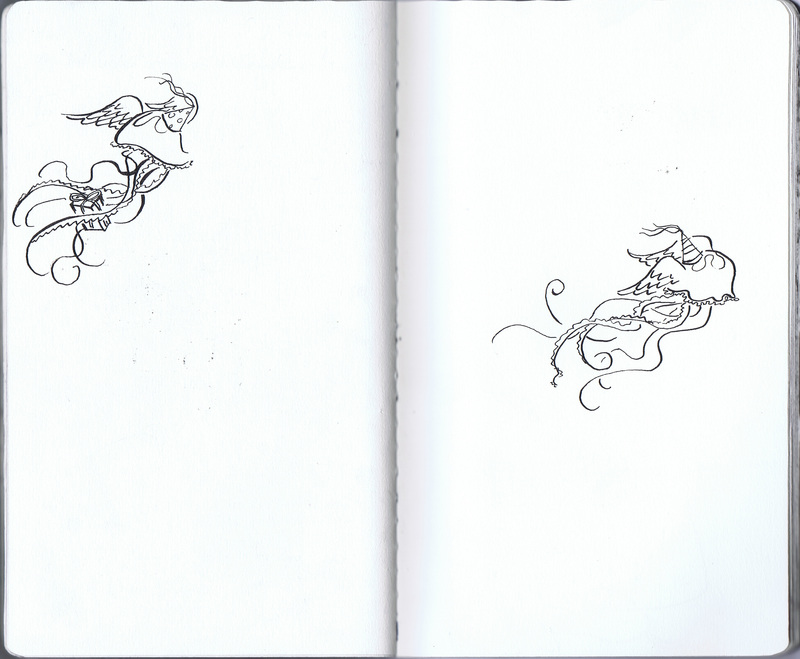 Page 66 and 67 – Pen and ink illustrations as suggested by the Random Dream Generator. Page 68 and 69 – Pen and ink illustration as suggested by the Random Dream Generator. Page 70 and 71 – Pen and ink illustration as suggested by the Random Dream Generator. Page 72 and 73 – Pen and ink illustration as suggested by the Random Dream Generator. 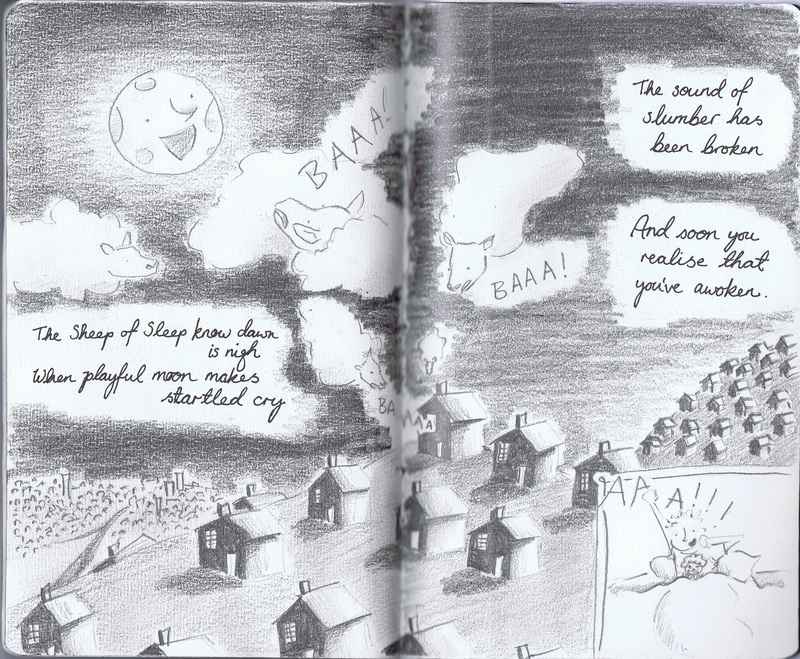 Page 74 and 75 – Pencil drawing returning us to the painted moon from an earlier story. 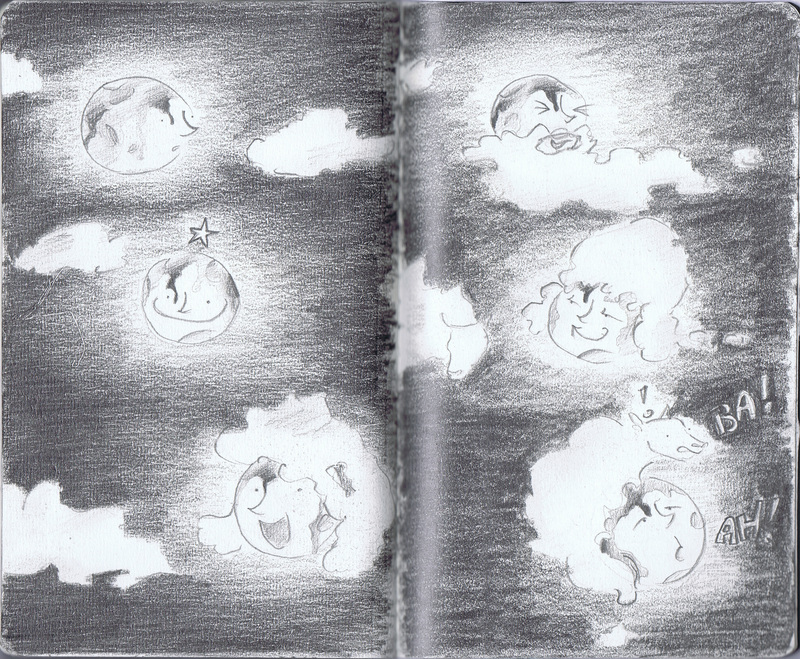 Page 76 and 77 – Pencil drawing of the moon playing with clouds as if they were different hairstyles. The Sheep of Sleep are reintroduced. 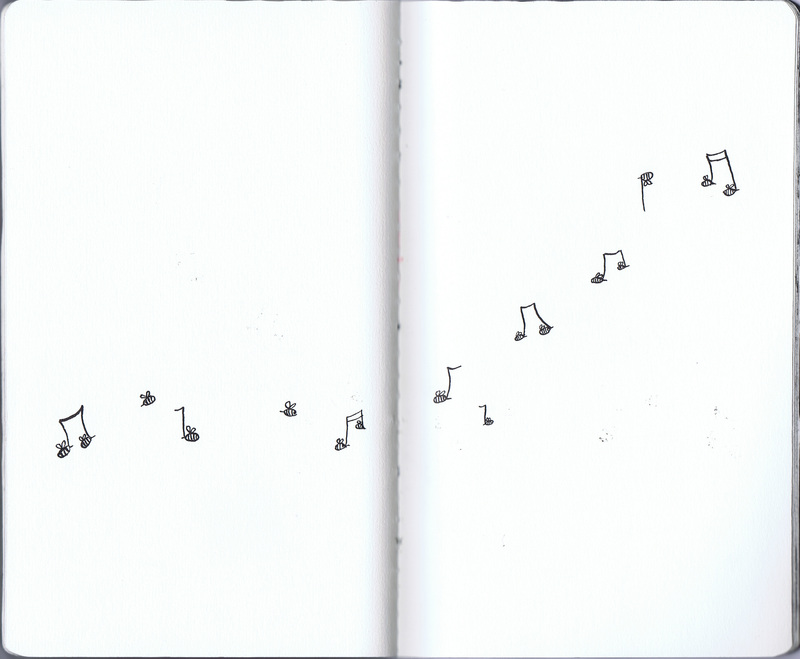 Page 78 and 79 – The Sheep of Sleep return to wake the sleeping boy we met at the beginning of the sketchbook. All drawn with pencil. 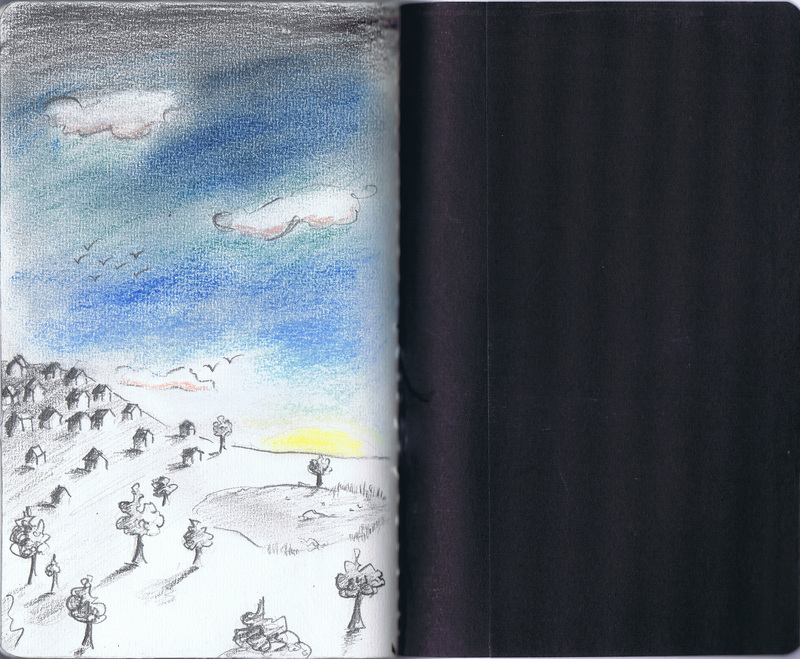 Page 80 – A pencil and chalk pastel sunrise bring morning and the conclusion of Nighttime Stories. I hope you’ve enjoyed looking through! Feel free to comment, I’d love to know what you think.